A big rally by the Chamblee Lady Bulldogs No. 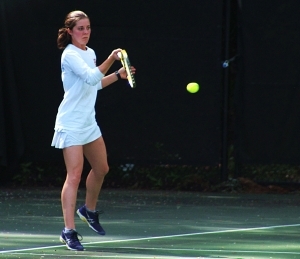 1 doubles team of Olena Bilukha and Madeline Meer proved to be the difference maker in a 3-2 victory over Carrollton in the Class 5A girls’ state tennis playoffs on Tuesday at Chamblee. Bilukha and Meer got off to a slow start against their counterparts Katy Nixon and Caitlann Arant dropping the first set 2-6 to fall behind. The Bulldog pair, now 8-0 on the season, built a 4-0 lead with a pair of service breaks in the second set only to have the Trojans’ duo rally to knot the set at 5-5. Bilukha served to give her team a 6-5 lead and then teamed with Meer to break Arant’s serve to claim the 7-5 victory. Arant and Nixon jumped out to a 2-0 lead to start the third set and appeared to be on a mission to win the match. Bilukha got a win on her service and a break of Arant again tied the match at 2-2. Meer won her serve and a service break of Nixon gave the Chamblee pair a 4-2 advantage. Bilukha again won her service to put the pressure on Avant who would serve with the match on the line. A service break by the Bulldogs clinched the 2-6, 7-5, 6-2 victory to give Chamblee a 2-0 lead as No. 2 singles player Grace Pietkiewicz won in straight sets (6-0, 6-4) over Carrollton’s Alli Hodges. Pietkiewicz cruised to the first set 6-0 victory, but Hodges got out to a 3-1 lead in the second set before the Lady Bulldog began to claw her way back into the set. Winning the next three games gave Pietkiewicz a 4-3 lead only to have Hodges hold serve to make it 4-4. Pietkiewicz (13-1) held her serve and then broke Hodges for the sixth time to clinch the victory. Madison Trinh won her first set at No. 1 singles against Sonya Ivashchenko 6-2, but was forced to a third set with the No. 3 singles Neena Katauskas taking the court against Audrey Best and the No. 2 doubles of Emilya Ershtein and Lila David battling Christian Avant and Kate Harvey. Katauskas, a freshman, rolled to a 6-0, 6-0 over Best to clinch the match for Chamblee and improve to 11-1 overall on the season. Ivashchenko rallied to defeat Trinh 2-6, 6-3, 7-5 and Avant/Harvey won 6-4, 7-5 over Ershtein and David as the teams completed the matches. The Lakeside Lady Vikings had their season come to an end in the Sweet 16 of the Class 7A state playoffs with a 3-0 road loss to North Gwinnett.